Whether you’re sipping a pint of kölsch in Germany or drinking a Heineken at a hotel bar in Hong Kong, there are a number of factors that can influence how much your beverage will cost. Cost of living is certainly a primary factor, but taxes, availability, type of establishment, type of beer (craft beer vs macro brew), and local tastes will also affect the price of your pint. 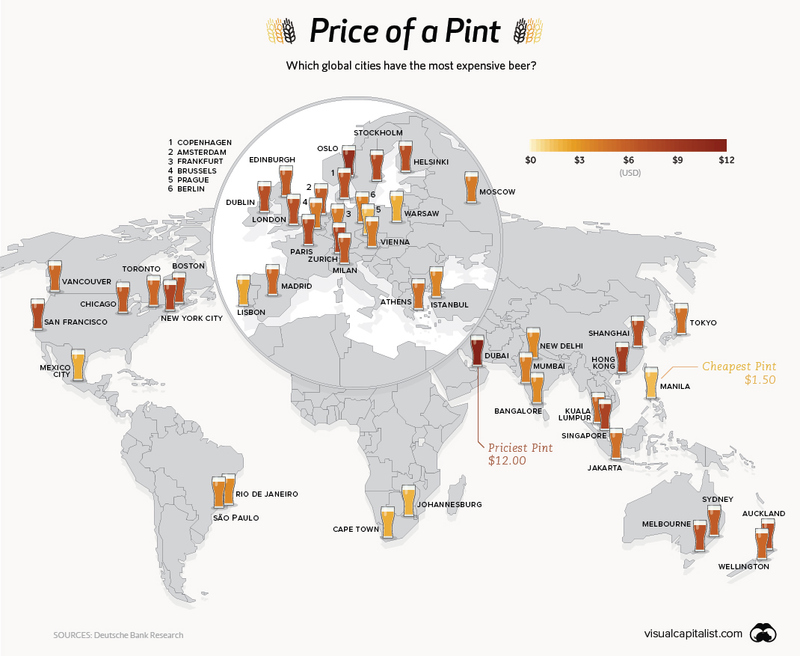 Analysts at Deutsche Bank recently gathered critical data on how much a pint of beer costs in various major cities around the world. Many of the cities that topped the price list have a higher cost of living, and it’s no surprise to see Singapore and Oslo rank near the top. The city of Dubai, however, is a unique case. Technically, drinking is only permissible for expats and non-Muslim residents in Dubai, and being drunk in public can come with serious consequences. That said, the city’s establishments serve beer with prices that reflect its high-end look and feel. Considering the scarcity and heavy regulations, those craving a pint might be happy to overlook the price tag of $12. The thirsty citizens of the Czech Republic consume the most beer by a long shot – a full 36% more than neighbors Austria and Germany. This is partially because demand is so high that companies are willing to compete on cost. As a result, beer is often cheaper than water in restaurants and pubs in Prague. Manila’s low cost of living and steady supply of domestic beer earned it the lowest price per pint on the Beer Price List. San Miguel, the Philippines’ largest brewery, dominates with a market share of over 90%, and beer consumption is also on the rise in the country. The median price of beer in the 48 cities analyzed was $5.70, and below is the full list of cities ordered from most to least expensive pint. It’s worth noting that the data collection focuses on expat (read: touristy) areas of the city. While that’s not a perfect picture of prices in a city, it does allow for a more consistent comparison of wildly differing markets.